/ Modified sep 20, 2016 11:01 a.m.
On October 11, Arizona Public Media will change its channel lineup. The change will not affect AZPM’s main HD station PBS 6, which will continue to be available on the same cable and satellite TV channels and over-the-air on channels 6.1 and 27.1. The programs offered on channels 6.2 and 6.3 will also be provided on channels 27.2 and 27.3 to provide greater consistency, and to make it easier for viewers to find their favorite programs. AZPM’s channel 27 program services provide over-the-air service to residents in the Catalina Foothills and Pusch Ridge. ReadyTV 6:00 a.m. – 6:00 p.m.
World 6:00 p.m. – 6:00 a.m.
UA Channel (currently on Cox 116 and Comcast 76) will transition to a digital-only platform, with programs available on azpm.org and on Arizona Public Media’s YouTube channel. These changes are being made after a careful review of audience viewing trends and program preferences. In addition to creating uniformity in where AZPM television programs reside, these changes will allow AZPM to improve operational efficiency and quality control, while providing more resources to create original programming for and about Southern Arizona. Arizona Public Media remains committed to its mission to educate, inform, inspire and connect our communities by bringing people and ideas together. A trusted in-depth news source and a provider of intellectually stimulating programming and thought-provoking original content, Arizona Public Media is working hard to build a better Southern Arizona. Where do I find ReadyTV programming? Ready TV programs will now air 6:00 a.m. – 6:00 p.m. Check azpm.org for full program schedules. Where do I find World programming? World programs will now air 6:00 p.m. – 6:00 a.m. I watch V-me on channel 6-2. Where can I find it after October 11? Beginning October 11, V-me will be replaced by PBS Kids on channel 6.2. V-me will only be available on Comcast 202 and Cox 81. I like the UA Channel. Where can I find it? Effective October 11, the UA Channel (currently on Cox 116 and Comcast 76) will transition to a digital-only platform and its original productions will be available online through azpm.org and on Arizona Public Media’s YouTube channel. Why is this channel change taking place? 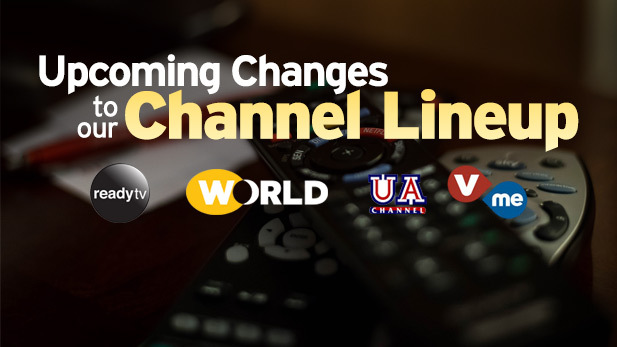 This consolidation of channels will make it easier for you to find your favorite programs. These channel changes also allow AZPM to reduce its capital broadcast equipment investments, focusing greater resources on production equipment used to create original content for and about our communities. Where can I find AZPM's full channel lineup? The full channel lineup with changes effective October 11 can be found online at tv.azpm.org/channel-finder.